The gist: It’s easy for an introvert to become overwhelmed by a busy social life. Here are 6 ideas to thrive socially without burning out. As an introvert, it’s shockingly easy to become overwhelmed by a busy social life. From going to work to hanging out with friends to attending networking events, it can be hard to come by much-needed alone time. Personally, I’ve been trying to solve this problem by ridding my calendar of (useless) meetings. These days, it’s not unusual to find myself racing around town for three or four different ones on any given day and jumping on a Skype call between them for good measure. I’m an introvert so I despise days filled rushing from group to group—it’s totally exhausting. At the same time, I’ve created this life. I’m free to choose which meetings I do or do not attend, yet I choose to attend many. It’s a funny predicament I’ve put myself in. I hate meetings, but I consciously end up in many of them. Why? Because I actually like meeting with people and building relationships. I think that says something about introversion many who don’t possess it struggle to understand. We’re not shy. We’re not hermits. We love building connections, we just find it tiring to do so. While I’ve worked to cut the number of meetings I attend, I’ve also attempted to understand my introversion better. I wanted to find the happy balance and never again sit through an important meeting feeling brain-dead. Thanks to new research about introversion and a healthy dose of self-experimentation, I’ve pinpointed a few important rules to follow when it comes to setting myself up for success at important meetings. For the longest time, I thought there was something wrong with me. I felt like a bad friend / partner / employee when everyone wanted to grab drinks, go out with friends, or form an after-work group and all I wanted to do was go home and not see anyone for the rest of the day. What I didn’t understand about myself then, and what much of the world still struggles to understand about us introverts, is that going out and being social does not energize us. Instead, it does the opposite. This is hard to fathom for the world at large because so much of the social world is built by extroverts—those who crave social interaction because it’s required to feel normal. More interesting is the reasoning behind this. What a number of studies tell us now is introversion / extroversion are more than just social preferences. They’re actually a personality trait dictated by how the neurons bounce around in our brains. Extroverts of the world go through each day feeling under-stimulated. Their brains (specifically, the neocortex) need extra stimulation to reach what’s known as optimal arousal—the state at which you feel normal and at ease. Social engagement provides that boost of critical stimulation, so they seek it out. We introverts, however, go through each day generally overstimulated. We need some sort of aid to bring us down to our optimal arousal level. Since social interaction is both stimulating and ever-present, we prefer to seek quiet solitude to keep ourselves operating just right and avoiding burnout. But how does that explain the situation we often find ourselves in—introverted, but craving social interaction? What about the extrovert who sometimes disappears off the face of the earth? Maybe the most important thing to understand about personality traits like introversion and extraversion—especially when it comes to managing a busy social calendar—is that they aren’t binary and they don’t dictate your behavior. 1. You are more than an introvert. We love dichotomies (you’re either this or that), but when it comes to personality traits, it’s not so simple. Most of us, actually, exist somewhere on a spectrum—between two poles—rather than falling all the way to one end or the other. 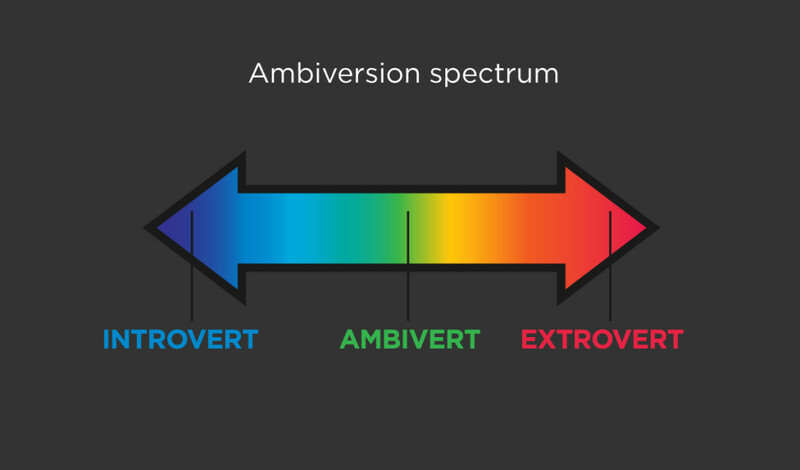 The new, popular term for this is ambivert. Most of us who identify as introverts are probably better described as ambiverts because, while we prefer quiet, alone time, we also occasionally enjoy large doses of social interaction. This explains perfectly how someone like me—who often loves to sit at home in total quiet—also happily schedules four meetings in one day all across town followed by a happy hour with friends. 2. You control your own behavior. Just because you have a strong preference for being alone doesn’t mean you shouldn’t ignore it to achieve your goals. Remember sitting at the dinner table as a kid not wanting to eat your broccoli? You had a very strong preference about your food, and it was that broccoli was horrible. Perhaps you even expressed it loudly, wondering why your parents would cook such a thing. But your parents—masters of persuasion—knew you liked video games (or whatever you were into as a kid) more than you disliked broccoli. And, oh guess what? If you eat that awful pile of green, you can play your new video game for an extra half hour tonight. You think for a minute, and then what do you do? You eat the broccoli. If you’re an introvert like me, you can identify perfectly with this analogy. I may have a strong preference for sitting home all day in solitude, but I prefer even more to do certain things that cannot be done sitting around twiddling my thumbs! So, instead, I choose to ditch my preference for quiet and chase those goals with every ounce of extroversion I can muster. That’s how, as an introvert, you end up with a jam-packed social schedule when you’d rather be doing anything else. Oy vey. People like us—who ignore our introverted tendencies to accomplish things—are at the greatest risk of social burnout. If you’re not careful, everything you’re working for can go up in smoke when it all becomes too much, your face seizes in place as if you’d eaten a lemon, and you have to hide under a blanket with a cat for a week before you can remove your thumb from your mouth and re-join the world. That’s why it’s so important to follow a few introvert-specific rules when it comes to managing your social calendar. I’ve experienced both the uninspired state that comes from living in a vacuum as well as the deafening overwhelm that takes over when I step too far outside of it. These are the rules I follow to keep myself social, happy, and steadily progressing towards my personal goals. They also keep me moderately sane. 1. I do not drink coffee. Caffeine is a helluva drug. I’ve learned, over and over, coffee is a horrible choice for me. It can give me a quick jumpstart on days when just getting out of bed is a struggle, but it’s the worst possible stimulant for social interaction. It speeds up my heart, raises my cortisol, gets me stuttering and talking too fast, and generally makes me look like an incoherent fool. 2. I schedule all social engagements back-to-back after lunch. I do this because as soon as I finish a meeting, I often don’t want to do anything else for the rest of the day. Morning meetings and events lead to very unproductive days for me. Since meetings, coffee dates, and parties help build relationships but do not actually get real work done, it’s important for me to fiercely protect my mornings as sacred getting-stuff-done time. This is the same reason I schedule meetings back-to-back if I have to do more than one in a day. I can go right into the next one before the dreaded, “Why am I doing this? I just want to pet a cat.” feeling sets in. 3. I clear my calendar after a big event. I want to make the best impression I can every time I meet with someone. As an introvert, I know I cannot do that the day after I’ve emptied my tanks on another event. I’d rather disappoint someone by making myself unavailable after a big to-do than disappoint them by not putting my best self forward. The more ambitious among us might say I’m missing opportunities, but I don’t see it that way. I want to be happy and social for a lifetime. I see it like running a marathon. If I sprint now, I will not make it to the finish line. In the end, I will get more opportunities by organizing my time like this than I would otherwise. 4. I don’t schedule important work on days I have big social engagements. If there’s a really important event I’m attending (I’ll be speaking at it, for instance), I do not even attempt to do other important work the same day. I know that I won’t be able to focus until it’s over, so I reserve these days for doing smaller errands rather than fumbling through important work. This is a rule I have learned the hard way. Like I mentioned before, it allows me to gather more and bigger opportunities over time by finding social and professional stability than the alternative. 5. I set deadlines for social engagements. Before I walk into a big event, a small meeting, or even a one-on-one coffee chat, I know exactly when I’m going to leave. Having a deadline and an excuse (even if it’s fake) to end my social interaction on my terms helps me be fully present while I’m in it. Since I know I have an out if I need it, I can listen and fully participate instead of worrying if I’ll burn out. If things are going great, my made-up excuse can wait. It’s easier and more fun to offer to chat longer than to cut someone off because you need to go. 6. I arrive early and spend time alone. This helps me center myself and prepare. Since I spend most of my time overstimulated, sitting outside an event listening to NPR or some soft music in my car for 10 minutes before going in helps me relax and prepare to engage with people without turning into a basket case. For this same reason, I also try to arrive early for any meeting. It’s never good for an introvert to have to rush to a social gathering (high cortisol) where you’ll need to muster as much calm energy as possible. Arriving early is also a great strategy for big events. It can be really uncomfortable to walk into a big group of strangers who all look like they already know each other. By showing up early, you’ll have a moment to connect with the host and you can greet and get to know people as they arrive. It’s a much more comfortable way to operate as an introvert. Being an introvert need not relegate you to a life of solitude. A vibrant social life that fits your personality and honors your brain chemistry is well within reach. These are the rules I follow, and they keep this sensitive introvert healthy, happy, and well-connected with my friends and community. See this interesting video from Wall Street Journal for more.